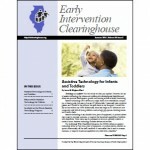 The Illinois Early Intervention (EI) Clearinghouse has partnered with the Illinois Department of Human Services to update and revise the family guide, officially titled The Illinois Early Intervention Program: A Guide for Families. When your child first enters the EI program, you want to know what to expect. The Family Guide provides an overview of the Illinois EI program and its services for you and your child. This revised guide is the culmination of a long process of reviews that gathered input from a wide range of people, including a focus group of parents who have been or currently are in the early intervention system. The newly revised Family Guide includes shorter, more readable text to help families enter and navigate the early intervention system. In addition, the layout is more open and engaging for readers. The easy-to-use worksheets are presented where applicable throughout the guide, not just at the end. And the guide has more clearly defined sections, which makes it easier to refer families like yours to the guide during different stages of the early intervention process. We hope that the newly revised Family Guide will answer many of your questions as you make your journey through the early intervention system. Parents who are just entering the system will find out what they need to know to get started. Parents with children already receiving services may find new information that adds to the quality of their experience with the program. The Family Guide is available in English and Spanish on our website. Copies are available from your local Child and Family Connections Office. We hope this easier-to-use and more engaging family guide will be helpful to families during the different stages of their journey in the early intervention system and the providers who serve them. Young children in early intervention (EI) may need extra support and patience as they explore the sensory world around them. Together, families and the EI team can plan for enjoyable sensory play and experiences that can give them the extra support they need to confidently explore their world. “Beep, beep—vroom!” Joey, a 9-month-old infant, loves riding in the car. He smiles and kicks his legs and waves his arms when his mom puts him in the car. His mom hears him giggling when they drive on bumpy roads and when the engine revs up. Lily, also 9 months old, dislikes riding in the car. She cries when her dad buckles the car seat and screams when the engine rumbles or the horn beeps. “Splish, splash, bubble bubble!” Hui, a 12-month-old, crawls over to the bathtub with a big smile on her face and pulls up on the edge of the tub when she hears the water running. After her grandma places her in the bath, she kicks her legs and plunges her hands into the water. Brandon, also 12 months old, crawls away from the bathroom when he hears the water running and protests when his mom puts him in the bathtub. He reaches up his arms toward her with a frown on his face. In the above examples, both responses are typical of young children’s behavior. Infants and toddlers are developing their ability to process and understand different sensory experiences. It is helpful for adults to remind themselves that the world is a new place for them. These very young children are discovering what kinds of textures, sounds, tastes, smells, and sights the world contains and what these experiences feel like to their bodies and what these experiences mean. Electric hand dryers, flushing toilets, thunderstorms, and fire sirens are all loud sounds. Some children hear these sounds and are frightened. Others hear these sounds and are very excited and interested. In time, children learn what these sounds mean. For example, the flashing lights and sirens from a fire truck mean firefighters are going to help someone. Knowing the sounds means someone in trouble is receiving help, and getting used to the volume and intensity of the sound of the siren after hearing it many times can make this sensory experience less scary. Families and EI providers can tune into a child’s sensory experience by watching her response to different sounds, tastes, textures, smells, and sights. Does she go toward loud sounds or turn away from them? Does he like vigorous swinging or does he cry in the swing? Does she laugh and smile at light tickly touches on her toes or relax and respond to firm pressure on her feet? By observing these differences, caregivers and an EI team can work together to provide opportunities that are “just right” for an individual child and help her learn about her world. This EI Clearinghouse newsletter will provide you with resources and ideas for everyday sensory play that can support the learning and development of young children.